Alegria is a name of yacht Elan Impression 50 ,which has been built in 2018. You can rent this boat from base Biograd in the region close to Zadar. Alegria is furnished with 12 berths. Beds on the yacht are configured in 12 (10+1+1) layout. 5 bedrooms are located inside the sailing boat Alegria. 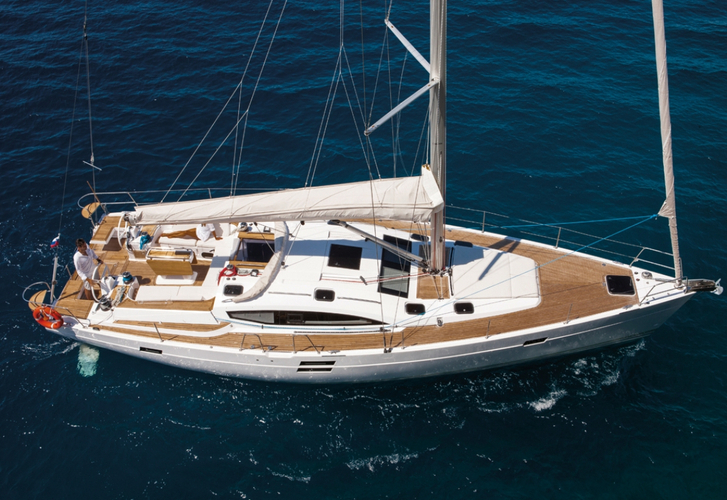 Use our website to find more boats in this section: Yacht charter Zadar. Passengers can feel good on this boat , because there are 2 WCs for their disposal. With 295.00 l l. in diesel tank you can sail really far and still be independent because of 605.00 l liters in water tank. Alegria is equipped with motor 80 hp. Yacht's dimensions are: lenght overall - 15.20 meters , beam - 4.70 m and 2.20 meters of draft. On the vessel you will find following equipment: Heating, Autopilot, Gps, Bimini top, Dinghy. . Nonrefundable caution is 2500.00 EUR. In our search machine you can quickly check avalailability of vessel Alegria from Biograd under the link: Yacht charter Croatia.